This felt like the complete opposite of a first issue, not even the previously on helped. A first issue should have all the information at hand or at least guide a reader into knowing where to read the story that came first. At the end of this comic, it had a handy-dandy guide for Doctor Who comics for the 9th-12th Doctor and a few other Doctors… Not the Seventh. There is no need to have seen the Seventh Doctor’s television run but be advised that reading what is before in the comics is what is needed. Find a guide online and read what is before. If you are prepared to go in for the Doctor be warned, this story has maybe 15 panels of the Doctor in each of the two stories in this comic, combined, with over 50 pages overall for this comic. This is not about the Seventh Doctor but his world, which is poorly executed on both stories. The writing jumps around a lot. Whenever the Doctor is shown is very brief. It appears this three-issue mini-series is not about the Doctor, with him being nothing more than a background character. The writing is best when he is around but when he is gone, for both stories, when he is gone, the writing then starts to feel very lazy. The plot has too many moving pieces that have been carried over, and if it does all come together in its third and final issue, then it does not seem apparently so as a possibility for this comic. The art in the first story looked really good. The colors complimented the scenery and when outside shots of stars are shown they look especially good. The second story’s art lacks depth. It looks purposely like an old-school art style to fit the Seventh Doctor, but the art style it tries to adapt does not look good, and neither does this. If going into this comic interested in the art, then it will be pretty disappointing once you get to the second story. First is good, but it is not great. A better term than good is average, which is still saying something for the comic industry today. Doctor Who fans might want to get this comic just for the name on it, but with a whole other world of comics for their fandom out, this is one that requires a skip. There are hints of the greater world, but those are very brief and more down to earth action is shown instead. That should be in another comic entirely as this feels like a mis-advertisement. This is not even worth the trade format (thus far). The next two issues require 5-star comics, and the trade should provide some background for it even to be considered a must-own in that format. The artwork in the first story helps, and if there was no Doctor at all in either story, then that is when riots should occur. 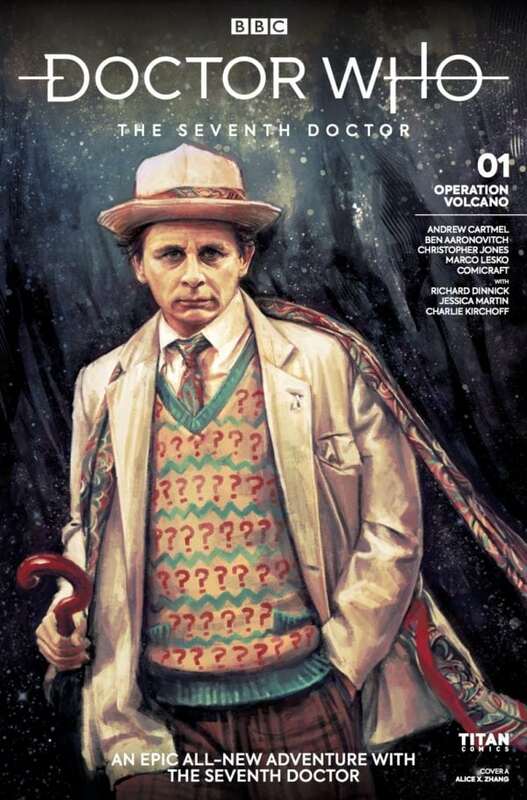 This comic is not titled Tales from the Seventh Doctor’s era or anything like that, not even simply Doctor Who. It is specified as The Seventh Doctor like he even really has a role, and that is the biggest problem with the comic, a lie.